One of the difficult aspects of Architectural Book reviews, particularly of monographs, is that they, like Art Books, are about the works of Artists. Artists make things, and the idea that a book with a lot of pictures about someone's work must itself be a compelling object is a given condition. It's like the air: all book reviewers must breathe it. One problem with the approach of making the book an interesting artifact, of course, is what to do with the words. The book is about the work of the Artist, and yet few can resist the application of words of explanation. (For architects, there is a theory that the fewer the pictures of built work, the more words are required to support what remains.) Worse yet, even great words almost always talk about the theoretical, academic, social, political, or fashionable context of the work. Never the rich, yet more ordinary, details of who the contractor was, what the architect's relationship was to said contractor, which crewmembers came up with a better detail on-site, which tradesman totally blew chunks, and which were instrumental in creating the work in the pictures. Sometimes, we may glimpse the relationship between owner and architect, particularly with larger institutions where that relationship is part of a publicity-fundraising machine. In short, the words never offer direct information that would be useful experience for doing such a project on your own. The tools are put away long before the writers get there. Yet the work is the work, wordless and resistant to languages. The monograph then becomes a tension between words and works, thinking and action. 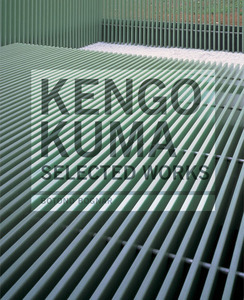 The new monograph on Kengo Kuma, by Bontond Bognar, might serve as a template for how to balance this word-work tension. The photography is gorgeous, large, and with minimal ornamentation. Each spread will offer an architect years of contemplation. Each project has a short and useful description. The work chosen for this book all dates from 1994, the latest phase of his ever-changing work. The PoMo stuff is left for the introductory essay, important as background but not in execution. The words are equally useful. Mr. Kuma's short essay is taken from a lecture he's been recently giving, about the sources of inspiration for his work, particular solutions and methods he is working through, and why his work has changed so radically since the 1980s. But no theory. One example of this is his fascination with Bruno Taut (who did two projects in Japan, who knew?) and how that inspired him to focus on the experience of places in general, and in particular specific experiences in Japanese vernacular architecture. 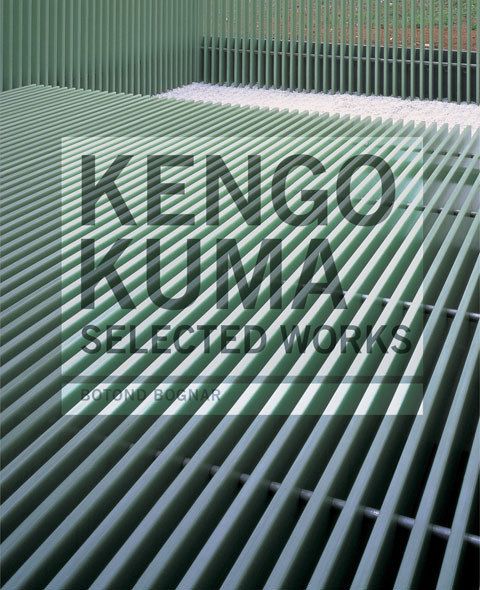 The similarities of his current work to Japanese vernacular forms are unmistakable, but that is probably because his projects provide similar space-sequence experiences. The Big Leap he makes is that the disappearance of a building abets the experience of it. He happily chooses not to attempt to describe the exact path from inspiration to execution. Mr. Bognar's essay is longer, but very informative. Full of facts about changes in Japanese architecture, from Modernists to Metabolists to New Wave to Wherever We Are Now, describing each in the context of the changing Japanese economy from the 1950s to the 1990s. He also relates the phases of Mr. Kuma's work to the radical fluctuations in the Japanese economy between 1970 and now. He does so in a way that causes me to open up my excel spreadsheet with my firm's execution plan and check to see if I'm insulated from current changes in the economy of the United States. In short, the writing is a door to action, relating experience and background context. I neglected to add that the buildings are incredibly beautiful. This book can be purchased at Amazon .